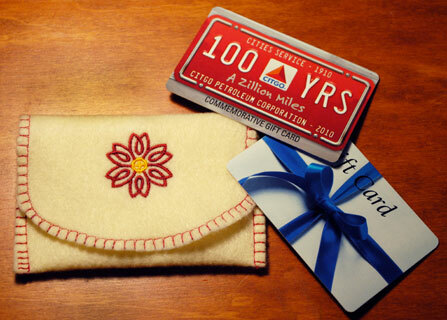 Christmas is just around the corner and gift cards are the perfect one-size-fits-all. Who couldn't use a gas card, grocery card, movie card, or restaurant card? This quick and easy project can be individualized for each recipient to add a personal touch. Cut felt to the size of the pattern. 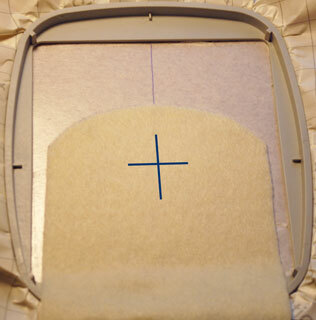 Mark the pattern's intersecting crosshair on the felt with an air-soluble marker. Hoop adhesive tear-away stabilizer and lightly score inside the hoop edge, careful to cut through only the paper backing. Tear the paper away from the hoop to expose the adhesive stabilizer. 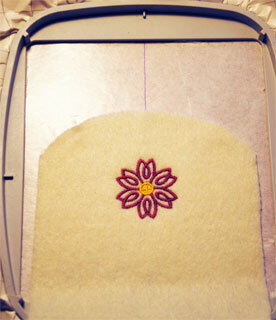 Finger press the felt in place, lining up the center marks of the hoop with the crosshair on the felt for central design placement. Stitch out the design of your choice. Carefully tear the adhesive stabilizer away from the felt. 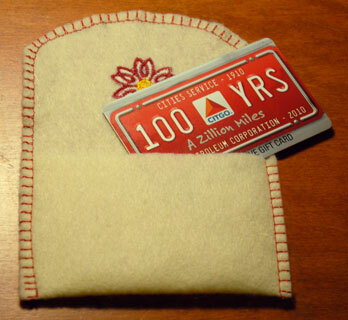 With the stitched design right-side down, fold the bottom square end of felt up 2 ½" to create the gift card pocket. Starting at a bottom corner at the fold, stitch up the side, around the front flap, and down the other side to close using a blanket stitch or overcast stitch. Fold the flap to the front and the holder is ready for a gift card. They can be used like this and inserted in a card or attached to another gift, or attach a decorative cord or ribbon to make a tree-ornament hanger. Embroider small single monograms for personalization. Metallic thread will give a more luxurious appearance. I like the dimensional contrast in this project, but if you don't want your stitches to sink into the felt quite as much, use a water-soluble stabilizer on top of the felt. These could be adapted for any occasion: birthday, baby shower, wedding gift, or appreciation gift, depending on the embroidery design chosen. Make several to have on hand when you need them. Hope you find many uses for them! Love this. Thank you for helping me out in ideas for this seasons xmas. Instead of handing out cards with checks or cash. Thanks, C.S. These can be created for any occasion. A handmade gift always beats a card, it's much more affordable, and can be reused! The Quickest Fall Decorating Ever Embroidery Advisor Presents: Courage. Strength. Cure.